DUBUQUE, Ia.—Join Catholic Sisters for an inside look at religious life. 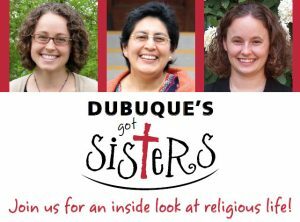 “Dubuque’s Got Sisters!” is a unique experience for those interested in exploring a call to become a religious Sister. Dubuque-area Sisters will accompany participants on a 24-hour tour of four tristate area convents and share experiences through praying, dining, and storytelling. Local transportation will be provided, and there is no fee to attend. The “Dubuque’s Got Sisters!” event begins Friday, April 22 at 5 p.m., and ends Saturday, April 23 at 6 p.m. To register or for more details, e-mail Sister Ginny Heldorfer, OSF, at heldorferv@osfdbq.org or call her at (952) 457-5193. “Dubuque’s Got Sisters!” is sponsored by the Sisters of Charity of the Blessed Virgin Mary, Sisters of the Presentation of the Blessed Virgin Mary, Dubuque Franciscan Sisters, and Sinsinawa Dominican Sisters (Wis). Participants of the “Dubuque’s Got Sisters” event will visit Mount Carmel, Mount Loretto, Mount St. Francis, and Sinsinawa Mound. Catholic Sisters who live and work in your community invite you to learn more about their work by visiting them online at www.facebook.com/catholicsisters.